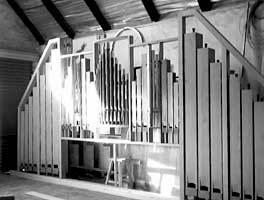 In the early part of September, our Roodepoort Parish of Our Lady of Sorrows will be graced by a beautiful new Pipe Organ. 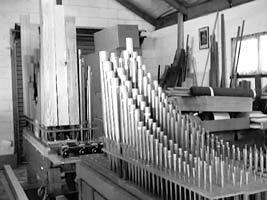 This was made possible by three very generous benefactors as well as the benefaction made by Mr. Jan Pekelharing from Port Elizabeth who is also the builder of the organ. 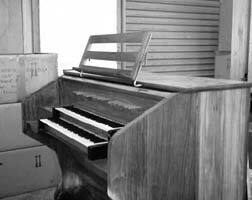 Normally such an organ is unthinkable due to its price. We must therefore thank our benefactors with all our hearts. We pray that it may give much glory to God. The front pipes can be seen with the complex air-feeding system. Whoever said that these organs are old fashioned? 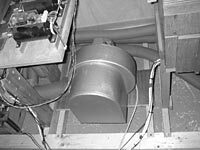 Below a view of the blower motor which had to be ordered from Germany since such noiseless motors cannot be found in South Africa.To the right a view of the specially designed electronic servo systems which control the selection of different pipe registers which then produece different kinds of sound.